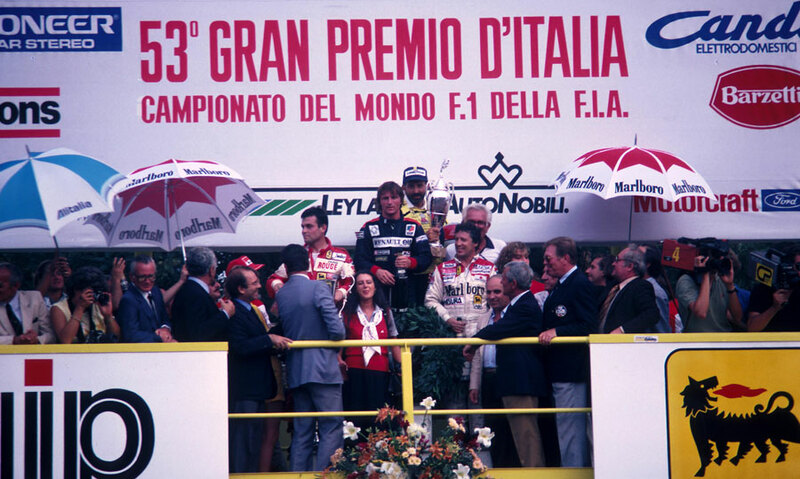 Rene Arnoux's third win of the season at the Italian Grand Prix ensured the title race would go down to the final race of the season in Las Vegas. Although Keke Rosberg, who retired when the rear wing pillar on his Williams broke at the end of the 24th lap, remained championship leader, John Watson's fourth place meant he still had a chance of snatching the crown. Arnoux's success was welcomed by the crowd as he had already been signed by Ferrari for 1983. The story of the weekend surrounded - inevitably at Monza - Ferrari. A fortnight earlier at the Swiss Grand Prix it had not had a car on the starting grid. But in front of the adoring home support that was not an option. Patrick Tambay had recovered from his neck problems enough to drive, but the appearance of former world champion Mario Andretti as stand-in for Didier Pironi caused near hysteria, all the more so when he took pole. Along with Watson, Niki Lauda and Alain Prost started the weekend still in the title hunt. But Lauda withdrew with mechanical difficulties after 21 of the 52 laps, and Prost retired while in third with a recurrence of the fuel-injection trouble that had plagued the team. Andretti squandered his advantage with a poor start while Prost slid onto the grass while trying to pass the Ferrari. Nelson Piquet briefly led before dropping back with a clutch problem, and within a few laps the 1-2-3 was Arnoux, Tambay and Prost. Prost's retirement allowed Andretti back into third and the order remained that way until the end. John Watson drove a strong race, finishing almost half a minute ahead of the Tyrell of Michele Alboreto. Nigel Mansell's Lotus took seventh place.